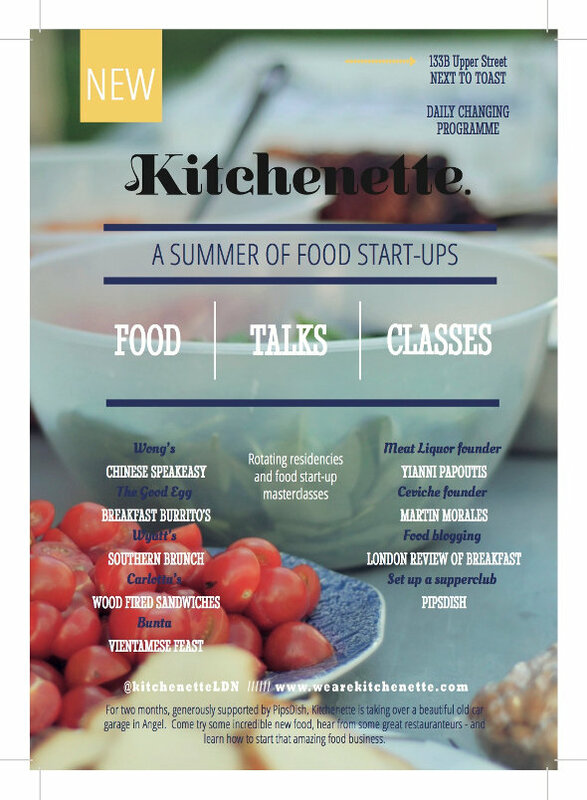 We at Kitchenette HQ are running a Kitchenette Pop-Up this July and August, in a disused Citroen car garage in Islington. It’s the first step towards us having our own kitchen – where food entrepreneurs can learn from people who’ve done it before, swap knowledge, support each other and share suppliers. Join us for talks, classes and all kinds of rotating residencies from some of London’s best up-and-coming food start-ups at 133B Upper Street, N1 FEATURING FOOD. The kitchen is both a testing ground and a showcase for our fantastic first cohort. We feature start-up food entrepreneurs in rotating residencies; that means delicious, original and ethically-sourced food from around the world, round the clock. The Food & Founders series brings you talks from London’s most successful food entrepreneurs: they discuss their journey from start-up to booming business, followed by a Q&A, while you sample their juiciest dishes. Vital food start up master-classes from some of the smartest folk in the industry. Sessions will focus on key elements of the business process, from designing a killer menu, to penning a food business plan, to developing top grade restaurant management. Join the Queen of London street food, Petra Barran, for a crash course in how to make it in the cut-throat world of street trading. Come on down and enjoy a seat outside for our special Southern Gospel Brunch in association with The Good Egg. Come and hear from some of London's most exciting restauranteurs and food entrepreneurs, telling the stories of how they got started. It's a truth universally acknowledged that an entrepreneur in possession of a good idea, must be in want of a partner. Venture capitalists invest in people, not concepts. An unmissable Sunday brunch brought to you by Patrick Williams and The Good Egg Brunch. Why do all day brunches end with the sun down? Join us to witness the famous Good Egg Brunch morph into an after hours extravaganza. For one night only, escape to the sun-kissed culinary heartland of the Basque region with Donostia Social Club's Pop-Up Pintxos Bar. Rain or shine The Good Egg Cafe is the perfect place for you to bring your little ones.